This morning the Government of Canada announced an investment of $885,000 to scale up the CAEH’s 20,000 Homes Campaign to accelerate progress on ending chronic homelessness in 38 campaign communities. The Canadian Alliance to End Homelessness is going to make the most of its $885,000 in new federal funding to help 38 participating communities adopt proven approaches to end chronic homelessness and begin the end of homelessness in Canada. 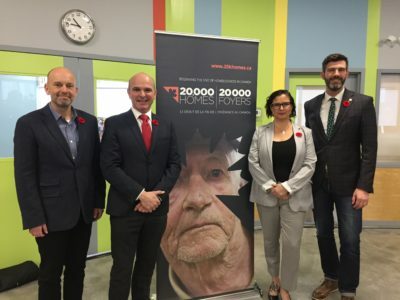 MP Randy Boissonnault announced the government investment this morning in Edmonton, which was one of the first eight pilot communities to take part in the CAEH’s 20,000 Homes Campaign. Edmonton has seen the most success of any major city in Canada in reducing homelessness—having cut homelessness by 43% in the last nine years. The funding will help the Canadian Alliance to End Homelessness extend the By-Name List and Coordinate Access System project to support the 20,000 Homes Campaign, which is a national change movement focused on ending chronic homelessness and housing 20,000 of Canada’s most vulnerable homeless people by July 1, 2020. There are currently 38 participating communities in eight provinces and one territory including 31 of the 61 designated communities involved in the federal Homelessness Partnering Strategy. To date, over 18,000 people have been housed by 20,000 Homes Campaign communities and 12 communities have achieved quality By-Name Lists. A By-Name List is a real-time list of all people experiencing homelessness in a community. It includes a robust set of data points that support coordinated access and prioritization at a household level and an understanding of homeless inflow and outflow at a system level. A Coordinated Access System is a way for communities to design, streamline, and bring consistency to the process by which people experiencing homelessness access housing and services. A strong system uses a By-Name List and Housing First approach. The funding will enable the 20,000 Homes Campaign to build on the lessons learned from the project. The project will also test the impact of three different options of support on the implementation of a By-Name List in achieving reductions in chronic homelessness. “With this investment, 38 communities will be able to take these proven approaches to accelerate their efforts to eliminate chronic homelessness and pave the way for the elimination of homelessness in Canada,” Richter says. By March 31, 2019, the CAEH will have received $1.3 million from the federal Homelessness Partnering Strategy. These investments are meant to help the federal government reach its goal to reduce chronic homelessness by 50% by investing in local communities to deliver a combination of housing programs and support services, as well as responsive and preventive measures. “Our government is committed to preventing and reducing homelessness in Canada,” says MP Rand Boissonnault, in the release. “Everyone deserves a safe place to call home. On June 11, 2018, the Canadian government announced Reaching home, the redesigned federal homelessness program, which will replace the existing Homelessness Partnering Strategy on April 1. As part of the National Housing Strategy, the Government of Canada announced a total investment of $2.2 billion for homelessness over 10 years.